Gary and Beth were relaxing on Treasure Island Beach. 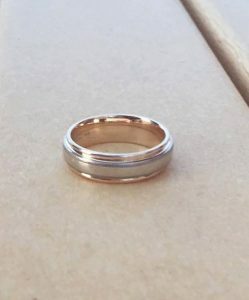 Upon leaving, a lounge chair was closed and her wedding rings were lost in the sand. They searched the area around the chair but no luck. The resort office gave them the name and number for SRARC and a call out was issued. As Joe Szemer arrived, Gary and Beth met him in the lobby. It was a short walk to the beach and the location of the lost items. A few swings of the detector and both rings were recovered. Mike and I went to beach where ring was lost Monday and found that a beach re-sanding pipeline had been laid right through the area that we were to hunt, we spent about 2 1/2 hrs hunting both sides of the pipeline and sand that had been moved around because of the pipeline. 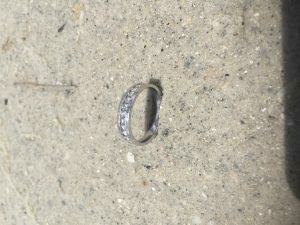 I called the ring owner and told her that we could not find her ring and why and she said maybe it had fallen out of her purse near the car when she was getting the keys out. She sent me a photo of where the car was parked and I went there and started detecting the grass near where the car was parked, Five minutes later the ring was found. Today she came here from Lakeland and was reunited with her ring, she was very happy and said if we ever need a professional photographer to call her. David & Melissa, from Atlanta, were just starting their vacation and celebrating their 20th anniversary. They just recently started wearing some very special rings that had been passed down to them. 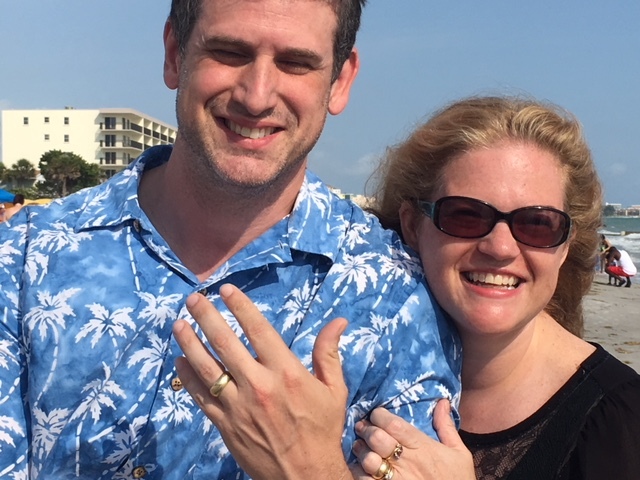 The rings were given to them by Melissa’s Great Uncle David & Great Aunt Lois who had been married in the 1920’s and were married for 70 years. Great Aunt Lois was blind for most of their marriage and Great Uncle David was truly devoted to her. 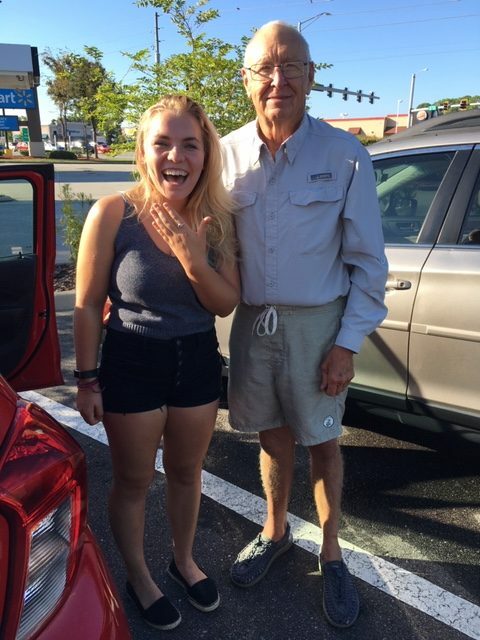 David was wading in the surf with his daughter when he felt his ring fall off his finger. 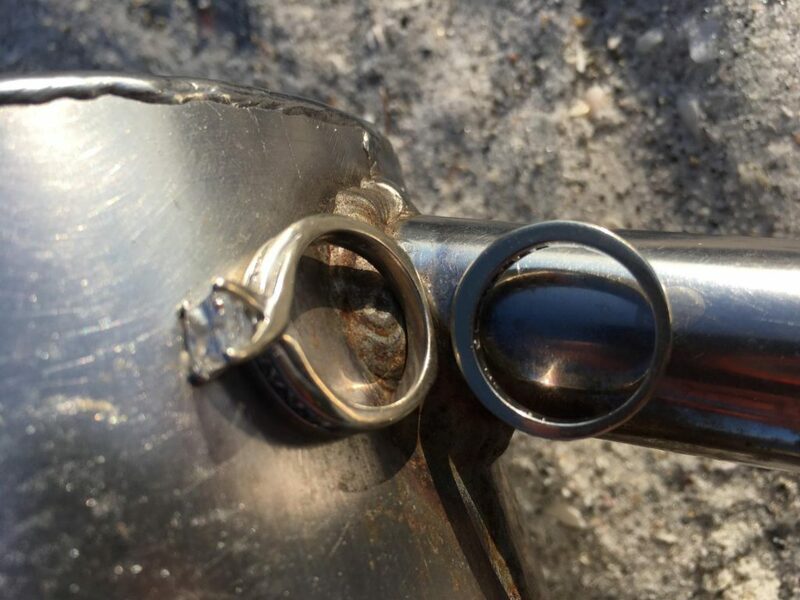 He and his family searched for several hours and had finally gave up figuring it was lost for good when a passing metal detectorist on shore had told them to search the internet for water detecting services that may be able to help. That in turn got Melissa find Ring Finders and in touch with SRARC and team member Stan Flack. A hunt was quickly organized for later that day and Stan along with Ed Osmar and Mike Shuler gave it a go in very rough waters. After about 45 minutes and a few dousing, Stan was able to walk over the ring and scoop it up from the ocean. A shocked and elated David and Melissa couldn’t believe it was found and vowed to never wear the ring in the ocean again. Great job to the Ringer finders group for sticking that one out. It was really rough out there. 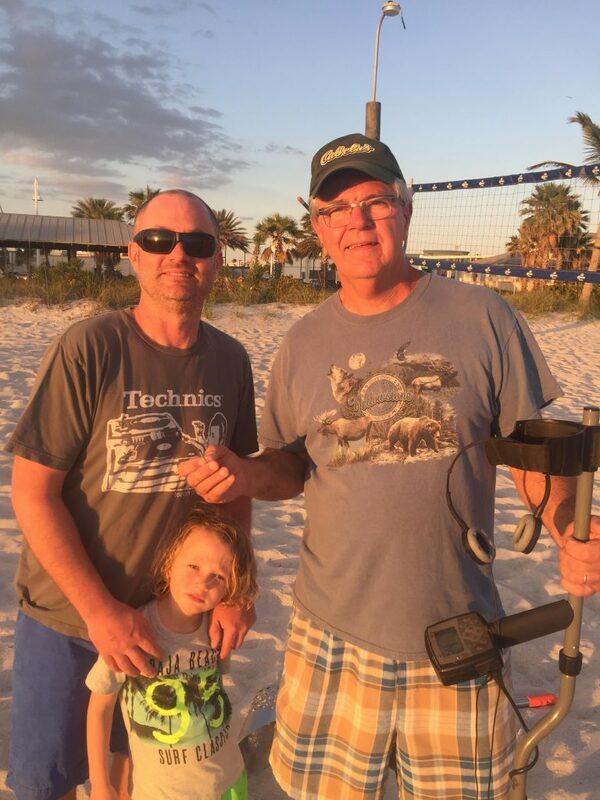 Visiting from New Jersey, Joe and his family were enjoying an evening at Clearwater Beach. Joe and his wife Gena, were celebrating their 10th wedding anniversary and Joe’s 40th birthday! 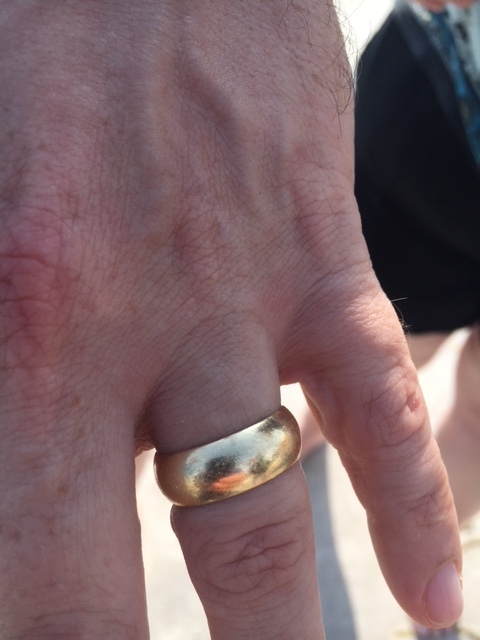 Once Joe got back to the beach house around 9 p.m., he noticed his ring was missing. 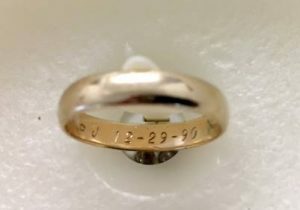 Joe spent a miserable night thinking about his ring and the next day decided to Google “lost ring.” That’s where he found SRARC on the Internet and called Ring Finder team member Stan Flack. A hunt was arranged for later that day. 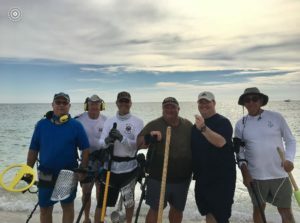 Stan along with Ring Finder members Ed Osmar, Paul Hill, Mark Sillence and Jerry Schneider met with Joe and started hunting a wide area that included the water and sand. 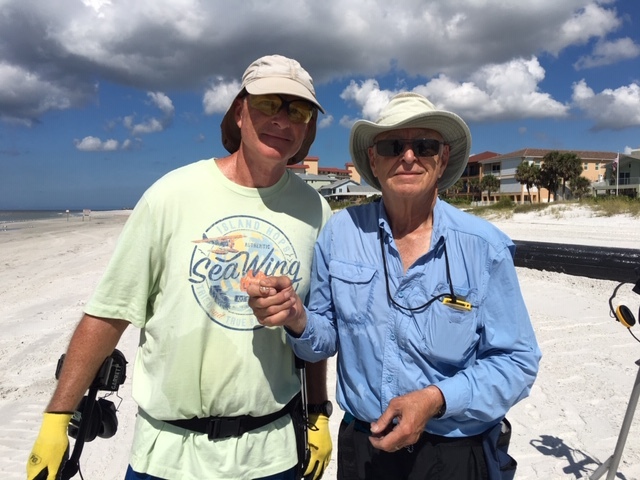 After about 15 minutes into the hunt, Stan came up with the ring, much to the delight of Joe! Hugging everyone and smiling, Joe exclaimed, “this is the best birthday present I could wish for.” Nice work, guys! We all wish Joe & Gena many healthy & happy anniversaries and birthdays together. This one will certainly be memorable! Like a good neighbor, Kenny is there! 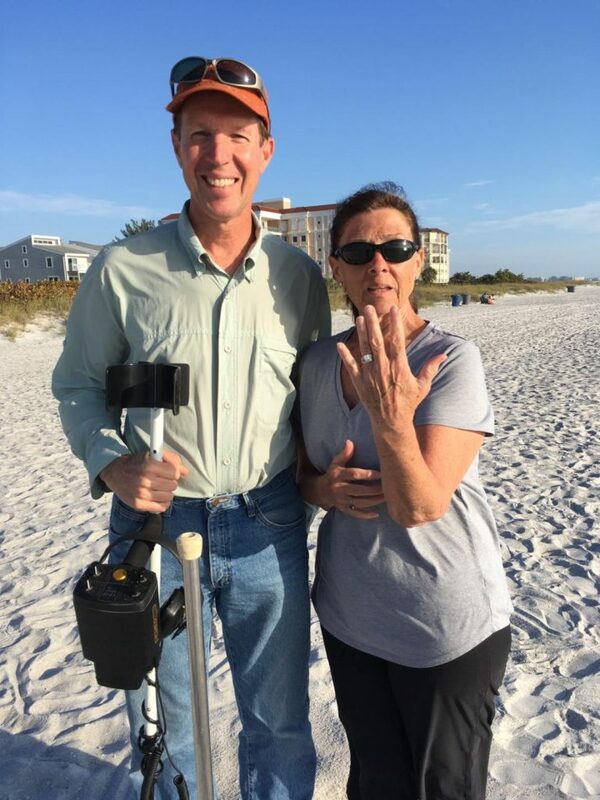 Eric was floating on a paddleboard with his daughter, picking up shells in shallow water when he felt his ring slide of his finger! The ring immediately went out of site. Fast forward 1o days later, when Eric mentioned to his neighbor, Kenny, that his ring was long gone and he was going to buy a new one. 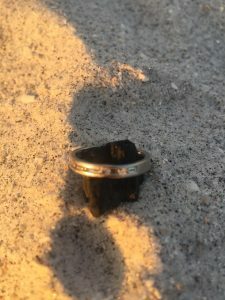 Last year, Kenny had witnessed SRARC in action when he watched them detect and find woman’s ring right at the hotel next to his condo. Kenny urged Eric to contact SRARC. Eric was reluctant and felt the ring was surely lost forever. Kenny, not giving up, walked to the Doubletree Hotel, made some inquiries about the metal detectorists he had previously observed. The desk clerk had SRARC’s card on file and provided the necessary contact information to Kenny. Stan Flack got the call and a team was formed. 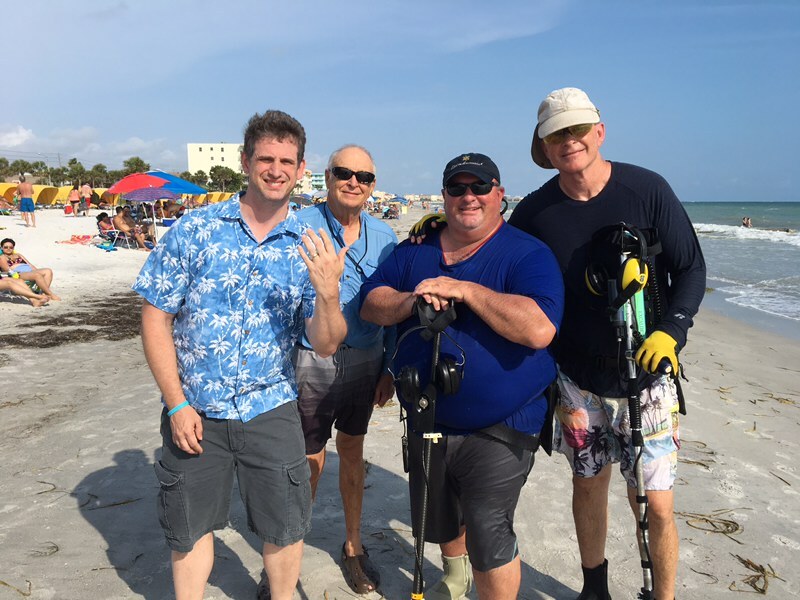 Stan and team members Ed Osmar, Paul Hill, Jerry Schneider and Mike Shuler met early on a Sunday morning and were determined to find that ring! 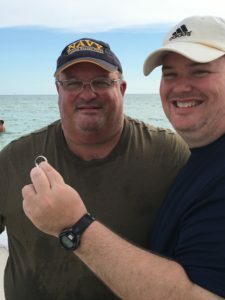 After about 15 minutes, Mike called the guys over to show them he had indeed found the ring! Eric was stunned upon hearing the news that his ring, lost 10 days ago on a busy Fourth of July holiday, had actually been found! 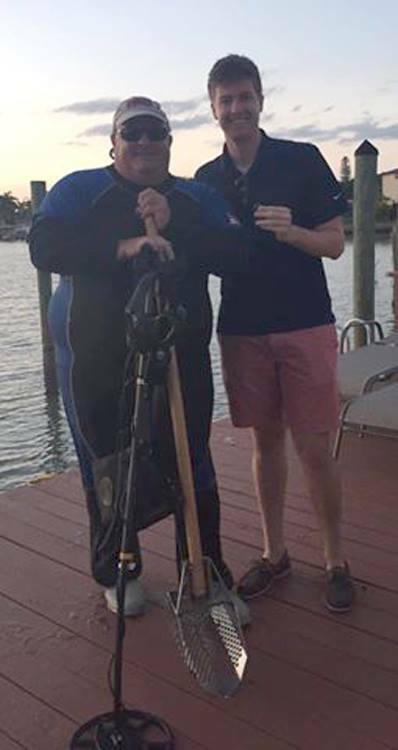 Mike is a Tampa fireman and made arrangements to meet Eric in Tampa to return the ring. 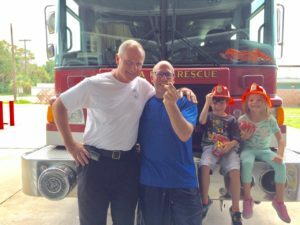 Eric’s children joined him and were excited to be in the fire station. Great tenacity and team work, guys! Everyone should have a neighbor like Kenny! 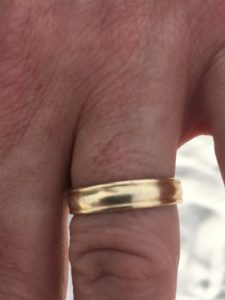 Teresa called SRARC and requested help finding a gold ring that was lost on Madeira Beach across from John’s Pass shopping area. This is a heavily detected area and time was of the essence. Ed Osmar headed out Monday morning and from the directions given to the club by Teresa, found the ring in short order! Ed met with Teresa and she was most grateful when he handed her the lost treasure! Thanks Ed, for representing us and our hobby so well! 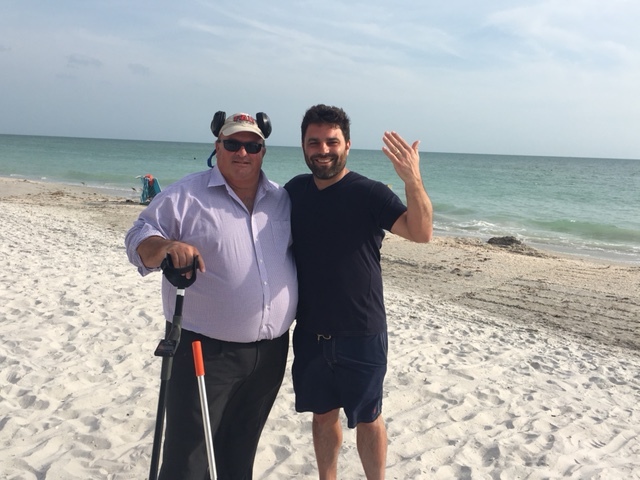 Bobby and his new bride were spending their final day on the beach in Madeira Beach with Bobby’s parents. Bobby decided to go for a swim and took his wedding ring off and put it on his towel before going into the ocean. Once Bobby got back to his trowel he picked it up and shook it off to dry off and just then remembered his ring was on the Towel. The family frantically searched the sand with their hands to no avail. Bobby’s mom, Louise searched the internet for a metal detector when she came across the SRARC web page. Louise gave Stan Flack a call and arrangements were made to meet within the next 30 minutes. Upon arrival, Stan was given a quick download on the tragic events and went to work. After a few passes, Stan got a clear signal and sure enough, there was Bobby’s ring. All were very relieved since Bobby had only had the ring a few months and was heading out in the morning back to New Jersey. One happy guy. Noo ne wants to start out in the dog house. Smiles and hugs around! 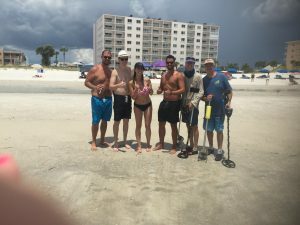 Erik and his family were enjoying a game of volleyball on Madeira Beach when his wife felt her Platinum 3 ring set slip off her finger. They gathered to whole family around the area and started searching for the rings. One of the group happened to see something shining which was the post and diamond of the engagement ring. After this they started searching with small sifters and found a second ring. They had no luck finding the third. Erik asked someone to google metal detectors and one of the members found a detector APP and downloaded that and hunted with his phone. Then they searched for metal detectors that they could buy. In that search they came across theringfinders.com and called SRARC, talked to Mike Miller then called Tom Jones. Tom agreed to meet them at the beach after dinner. He and Joe Szemer headed out and met up with Erik and his son Jackson. 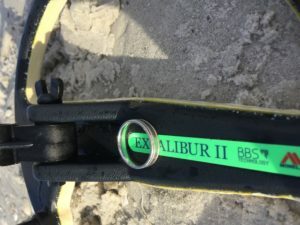 Erik led them to the volleyball court and drew a square in the sand where the first two rings were found and hopefully the third would be found. Tom and Joe started hunting and within minutes the ring was in Tom’s scoop and returned to Erik. Jackson wanted to go back to the condo and trick his mother into thinking that the ring was not found. “Not Recommended”. 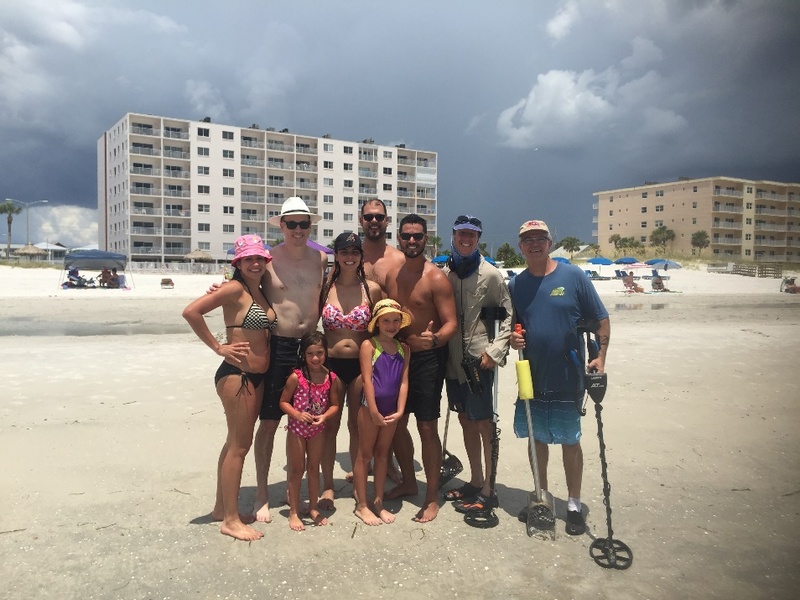 Garrett and his wife Kristin were spending the weekend on Madeira Beach with her two brothers and their families. They had all decided to do a special trip to the beach celebrating Kristin’s niece’s birthday. Saturday afternoon Garrett and his brothers in law were tossing a football in the water when his wedding ring came off his finger and he watched it drop in the water and disappear in the sand below. He and Kristin were married in March and now the ring is gone just 4 months later. Kristin’s niece asked them if they were still married now that the ring was gone. They reassured her “yes we are still married”. 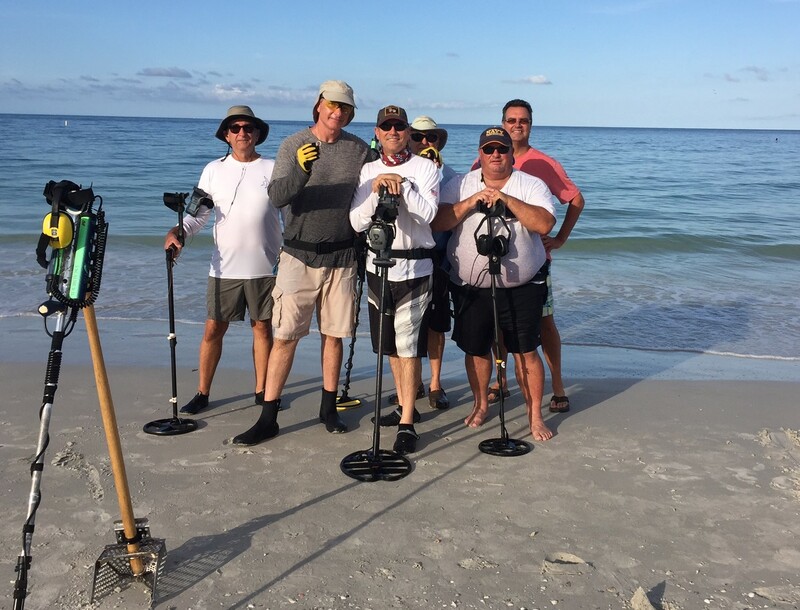 Jonathan, Garrett’s brother in law started a Google search to rent a metal detector and contacted Phil Myer of Myers of Myers Detector Depot. Phil told him to contact SRARC and they would come out and search for it. Jonathan contacted Tom Jones who was having lunch at the time with Joe Szemer on Treasure Island. After lunch the two headed up to Madeira Beach and met up with the family. After getting the details Joe and Tom started searching. The hunt went on for 45 minutes and neither hunter had found a single target, much less the ring. Tom started hunting a pattern up and down the beach moving closer to the water line each time thinking that the tide was going out and waist deep water at noon could be knee deep by 2:30. Finally a good target was heard and the ring appeared in Tom’s scoop. The whole family ran over the see the ring, amazed that it could even be found. Before saying goodbye, Tom gave them his normal newlywed speech. “Remember this day for the rest of your married life. If a time comes when things get tough, remember back to this day and realize that nothing is impossible”.